On the 10th of August 2017 NOAA (National Oceanic & Atmospheric Administration) the United States Federal Agency in charge of climate science released its latest report on the previous year. It makes for ominous reading! Major greenhouse gas concentrations, including carbon dioxide (CO2), methane and nitrous oxide, rose to new record-high values in 2016. The 2016 average global CO2 concentration was 402.9 parts per million (ppm). 2016 was half a degree warmer than the 30 year average ending in 2010. 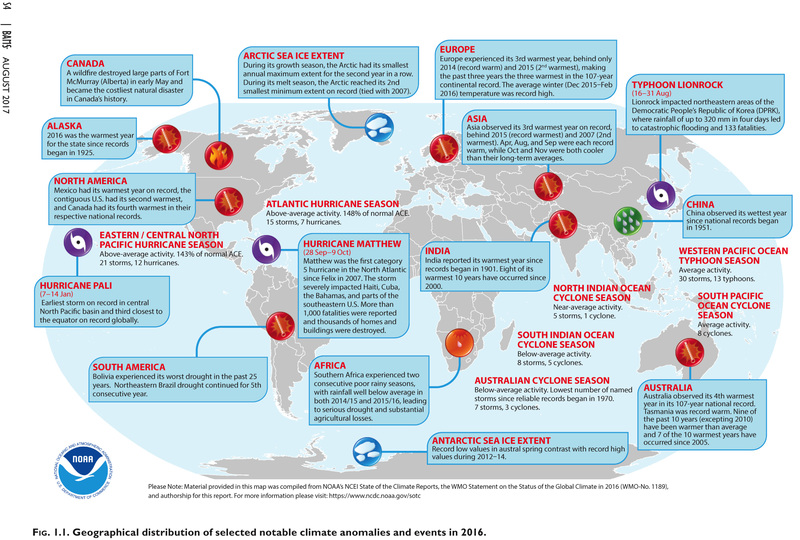 The 2016 combined global land and ocean surface temperature was a record-high for a third consecutive year. 4 major investigations showed the increase in temperature ranged from 0.45°– 0.56°C above the 1981-2010 average. The 4 major studies showed averaged sea surface temperature for 2016 was 0.36 – 0.41 degrees ˚C higher than the 1981–2010. 82 mm higher than that observed in 1993, when satellite record-keeping for sea level began. Extremes were observed in the water cycle and precipitation. A general increase in the water cycle (the process of evaporating water into air and condensing it as rain or snow). The longest such stretch in the record. Drought conditions were observed in north eastern Brazil for the fifth consecutive year, making this the longest drought on record in this region. The 1981-2010 average is 82 storms. Three basins – the North Atlantic and Eastern and Western Pacific basins – experienced above-normal activity in 2016. In the first article we looked at the recent health study that predicted 152,000 deaths a year due to climate change in Europe by the end of the century. Many said the 3˚C the study was based on was too pessimistic but the NOAA report based on 4 major studies shows that at the moment 3˚C is not pessimistic at all but at current rates this would be achieved in 35 years not by the end of the century and if current rates continued we could be looking at a 7˚C+ by the end of the century. But what is happening in Wales? We have already looked at how our summers seem to be changing but what can we find out from historical records. 1. Greenhouse gases were the highest on record. 2. Global surface temperature was the highest on record. 3. Average sea surface temperature was the highest on record. 4. Arctic sea ice coverage was at or near record low. 6. Tropical cyclones were above average overall.